This website is the home of the FHWA Transportation Performance Management Toolbox. The TPM Implementation Guidebook provides clear practical actionable steps that state DOT leadership, management, and staff can implement to enhance performance management practices. The TPM self-assessment helps to determine your organization’s level of performance management maturity. Your assessment results are linked directly to the guidebook and other resources on this site. The TPM Resources Library contains best practices, precedents, and other helpful resources. Browse the library or quickly navigate to a specific document using our search tools. What is transportation performance management? Transportation Performance Management (TPM) is a strategic data-driven approach that uses system information to make investment and policy decisions to achieve performance goals. By adopting TPM principles, transportation agencies can ensure the right bundle of projects is selected to produce desired performance outcomes. Why should transportation agencies adopt transportation performance management? TPM leads to improved performance. The condition of bridges, pavement, transit vehicles, and bike infrastructure will improve within a TPM practice, leading to improved conditions for system users in areas such as safety, mobility, and public and environmental health. Using data, agencies can allocate resources to address regional priorities and ensure that every dollar is spent to impact performance in a positive way. The tools available here are intended to assist staff from transportation agencies in learning about and implementing TPM practices. The Guidebook and Resources tools enable you to learn more about TPM while the Self-Assessment allows you to assess your current TPM capabilities and identify actions to improve those capabilities. Information within the Toolbox is geared towards both state and local transportation agencies. The ten TPM components are shown below, numbered 01-06 and lettered A-D. Each component relates to the others in particular ways, indicated by arrows and position within the Framework. While components are numbered from 01-06 and A-D for ease of reference, TPM activities do not necessarily happen in order. The figure illustrates some of the linkages and feedback loops that are inherent in TPM. 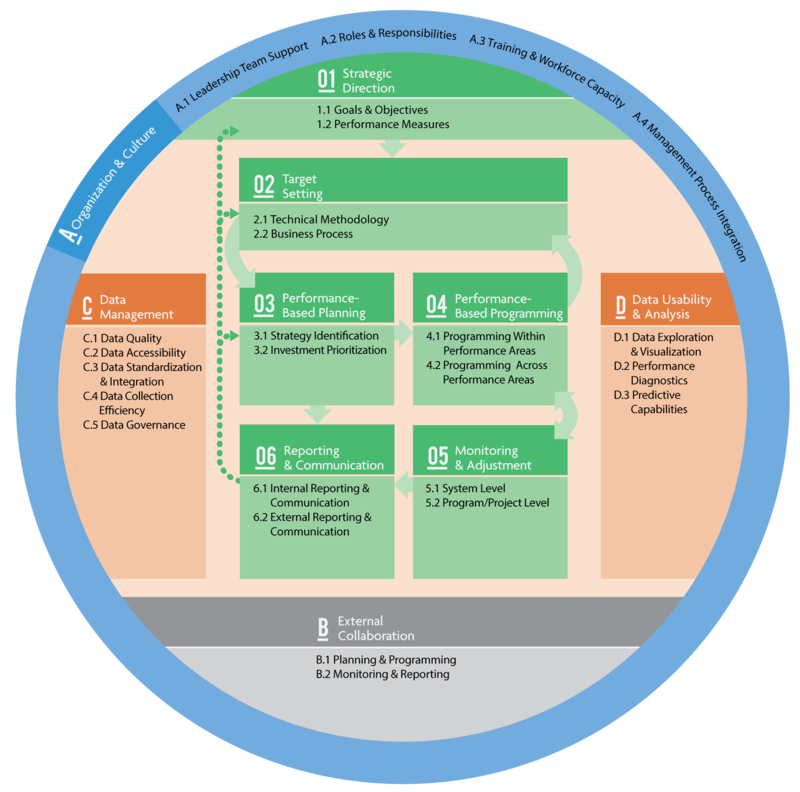 Click on the components to explore the framework through the TPM Guidebook.